For those New Yorkers looking to spoil their small sidekicks, look no further than New York Dog Nanny. Situated on the second floor of 126 Lexington Avenue, this dog-centric business has it all and then some. As the name implies, New York Dog Nanny offers a whole array of boarding services to fit every owner and pup’s need. (Many services are just for dogs under 35 pounds). For those busy 9-to-5ers, owners can turn to New York Dog Nanny for doggie day care. Starting at $45 a pop (discount if you buy packages) your co-pilot will not only get to lounge around rooms decked out in stylish Shabby Chic décor and human-size couches but also gets to be absolutely spoiled by everyone there. From receiving a walk or two a day to being able to lap up filtered water and playing with other pint-size friends, this place is heaven for your little sidekick. And if your dog is more on the finicky side, it is not uncommon for the team to hand-feed picky eaters (true story). This sort of service doesn’t just stop for daytime visits. New York Dog Nanny also offers boarding – at their place or yours – when Bermuda, London or Thailand is calling your name. 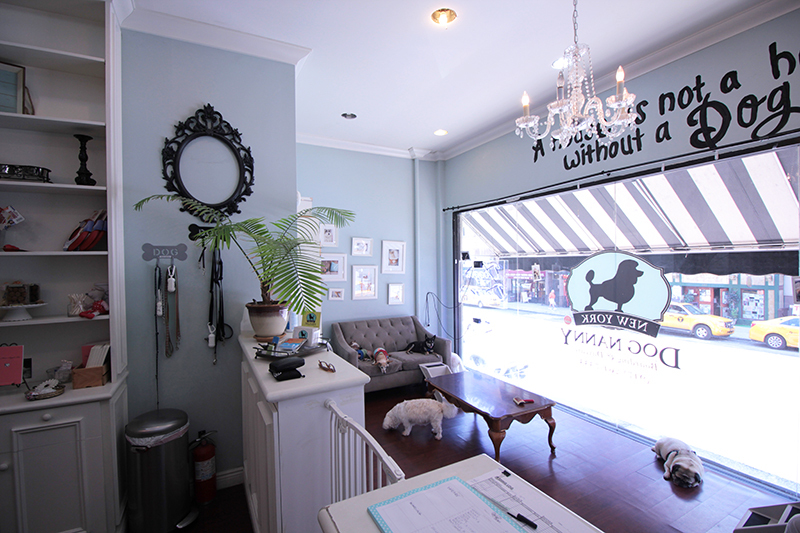 Plus, it has a full-on dog grooming service if your pup needs to be spiffed up a bit. 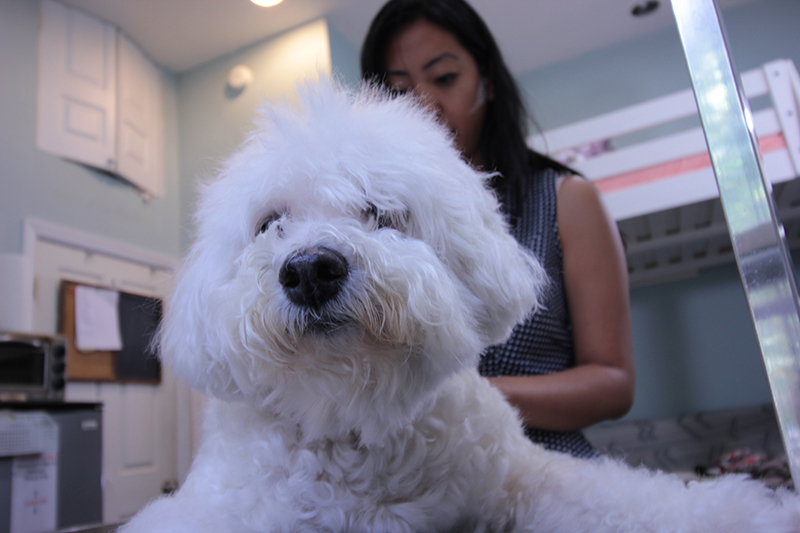 Besides baths and haircuts, New York Dog Nanny also offers mani/pedis, facials, hot oil treatments and “teeth scaling” to remove all that grime (because you definitely don’t want to do it). For those people a bit cautious about bringing their dog to a groomer, don’t fret. 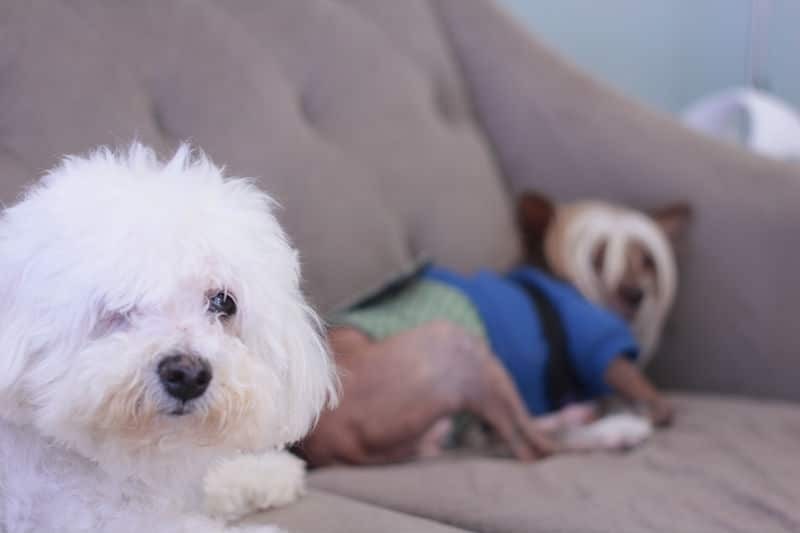 All New York Dog Nanny team members are extremely gentle with the dogs, as they realize they are dealing with a dog’s body and need to build up a level of trust. The business also has trainer in case your dog’s manners could use a little help. Ryan, sometimes cited as the “Dog Whisper of NYC,” not only provides the basic commands but can also work on tougher behavioral issues like separation anxiety. While this places definitely has all the bells and whistles, much of what makes New York Dog Nanny unique, is the woman running the show, Cynthia Okimoto. Not content with just having a run-of-the-mill doggie daycare, Okimoto has incorporated her own unique talents in holistic services – with a major focus on the Reiki technique. What does that mean you ask? Don’t worry, you aren’t alone. Reiki is a type of energy work and uses the same approach as other Eastern medicine practices, like acupuncture. It entails hands-on healing where Okimoto touches and hovers over an animal’s body, looking for blockages and pent up energy. For instance, if a dog has stagnant energy in her knee, she may not be able to walk very well. Okimoto will get in there, scan the pup’s body with her hands, detect this energy clog and start to release it, so there can be blood flow allowing the pooch to get back to a nice and normal state. Okimoto also practices muscle testing, a technique based on resistance, and her own intuition to compliment the holistic services. She says these non-invasive techniques can be used to help senior dogs, for allergy assessments, help health-related issues like arthritis and to provide a little boost to a puppy’s immune system. Her talents don’t stop there. Okimoto has also taken up “animal communication” to help owners deal with ailments, behavioral issues and to satisfy their general curiosity. Consultations are done in-person, over the phone or by email and all she needs is the dog’s name to be able to reach the pup through the person’s energy. Okimoto hasn’t only helped dogs overcome issues like barking, she has also assisted cats, bunnies, rats and even a tortoise. Twenty minutes will set you back 39 bones. The future of New York Dog Nanny will continue to focus on the human-dog bond by hosting workshops and classes. While New York Dog Nanny offers a plethora of services, Okimota believes it’s the people more than the offerings that keep customers coming back.